Does this conversation sound familiar to you? I often find myself in the middle of this or some version of this conversation with my 5-year-old daughter, Rose. It usually comes when my 2-year-old daughter, Juliet, gets to choose which show to watch, or when I play a game with her. Jealousy kicks in, and immediately I’m accused of having more love for Juliet. Never mind the fact that Rose usually gets to pick our shows and activities because her younger sister’s communication is limited to 2-word sentences. As humans we are really good at jealousy. If someone else gets attention, love, money, property, or anything else, we see it as something we ourselves are not getting. We live in a mindset of limitation. There is only so much money in the world, so much time in the day, and so much attention we can give or receive. If someone else gets any of it, that’s something that we are not getting. 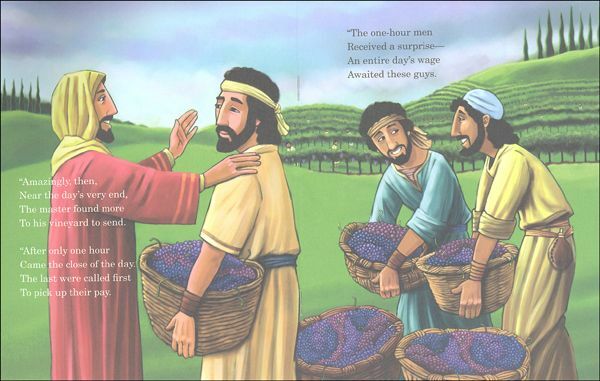 In Matthew 20:1-16, Jesus tells about the kingdom of God through a story of a landowner who hires workers throughout the day to come and work in his vineyard. He agrees to pay them all what is fair, and at the end of the day he invites the workers to come and get paid. The first to get paid are the people who started working in the evening. They are paid a full day’s wage for an hour or two of work. Very last, those who worked the full day come in. In verse 10 it says, “…they assumed they would receive more. But they, too, were paid a day’s wage.” They are not happy about this. They ask how the landowner could pay the same to people who have been working for an hour and people who have been working all day in the scorching heat. This arrangement is not fair, but that’s the beauty of the kingdom of God. God is not fair. God has infinite grace, love, and forgiveness. There is enough and more than enough for everyone. This is extremely difficult for us to wrap our minds around. In our limited, zero-sum-game world, how can God have enough love and grace for all of us? How can others getting more not mean that I get less? The answer is that God isn’t fair; He’s better than fair. This infinite love means that instead of jealousy fueling a desire for more, we can be fueled by thankfulness and joy for a God who gives all we need. We can celebrate together the fact that we all share equally in God’s love and grace. Because in the end none of us can earn grace, God gives it. And God gives it unfairly.